A constellation of symptoms and findings caused by reflux (backwards flow) of stomach acid into the throat or larynx, typically during sleep. Laryngopharynx acid reflux disease (LPRD) may be seen with or without the heartburn, acid belching, etc., commonly associated with gastroesophageal reflux disease (GERD). The classic symptoms of LPRD may be exaggerated in the morning and include one or more of the following: dry throat, rawness or scratchy sensation, increased mucus production and attendant throat clearing, husky voice quality or low-pitched morning voice, irritative cough, and, if one is a singer, the need for prolonged warm-up. For appropriate treatment measures, see GERD. 1. Originally published in Classical Singer, April 2009. Posted with permission. This man has obvious clinical symptoms of acid reflux such as heartburn, excessive morning mucus, husky morning voice. Note classic interarytenoid pachyderma, diffuse pinkness. Here we see loss of color differential between true and false cords. Capillaries are prominent (like bloodshot eyes) on the true cords. There is also adherent mucus. Even the upper trachea shows evidence of redness and inflammation. This is not seen that often except with truly severe nocturnal acid reflux/ LPR. 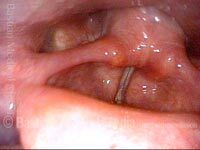 This entry was posted in Multimedia Encyclopedia and tagged Disorders, Inflammation/Laryngitis, Other benign mucosal lesions, Photos, Voice & other larynx disorders by admin. Bookmark the permalink.